The Electrify interface. Confusing for about 30 seconds then as easy to use as can be. For a while there it was touch and go. The iPad looked like being a super fancy consumer device, perfect for on sofa web browsing, game playing and one finger emailing, but not a patch on real Old Skool computers for doing anything remotely creative like image manipulation or music making. Well that lasted about 6 months or so, at least until the likes of Photogene, Camerabag and Colorsplash (along with tons of others) redefined image editing and Garageband kicked off a new breed of music creation tools, which moved things beyond the simple instrument replication and into the realms of real digital music creation. Initially these were fine, but confusing. Either trying to be digital versions of real life drum machines, pianos and, er, guitars or trying to be the one size fits all, digital audio workstation. The main issues with the former being that the touchscreen wasn’t a real keyboard, drum pad or guitar string, so it didn’t have any physical response or its interface didn’t take advantage of the iPad’s potential. Worst, by a mile, was ReBirth, which totally ruined the presence of two 303s, an 808 and a 909 with the kind of interface that was ponderous and over complicated. The main issues with the latter was also interface related and pointed to rushed development times and a lack of understanding of the audio creation process. 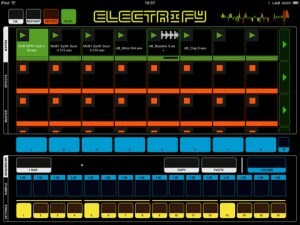 The two interfaces for iElectribe apps. While the original interface, below, may resemble the real world machine, it looks far less fun than the Gorillaz version above. Now that Garageband has set the basic standard, there has been a massive jump in quality of genuinely great music making apps. Two of them in particular have really grabbed my attention, the Gorillaz’s version of the iElectribe and Electrify. 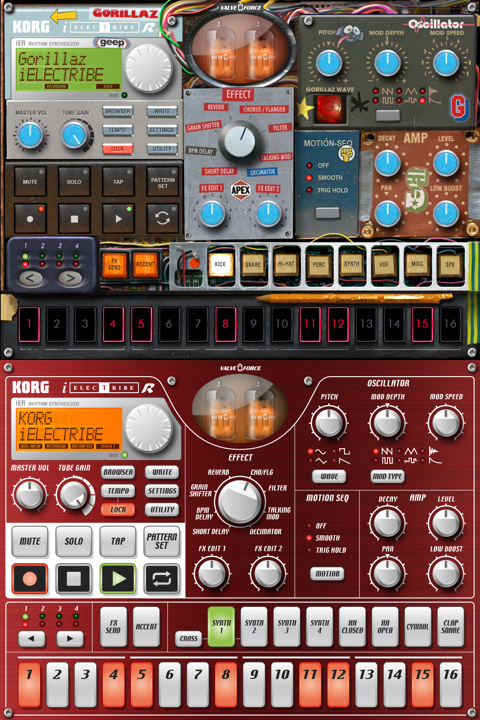 The Gorillaz’s version of iElectribe really illustrates the value of great interface/skin design as it’s essentially exactly the same app as the Korg iElectribe (albeit with different samples), but looks way more fun and easier to use. 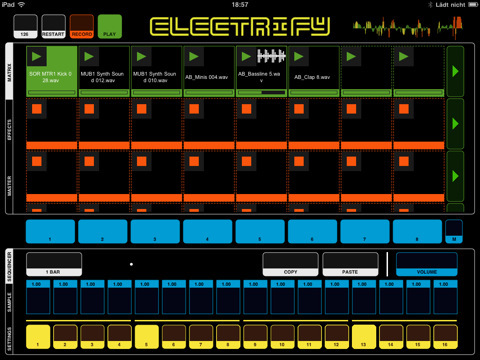 And the Gorillaz version is super fun to use, allowing you to play about with 64 samples from the Gorillaz’s The Fall album and giving you a host of options to make the sounds your own while creating your own patterns. And it moves beyond simply being a glorified drum machine by having a variety of instrumental and vocal samples. Still it’s irritating in two key ways. First, changing the pitch of individual sounds is controlled using a dial and is almost impossible to get right. Second, and far more irritating, you can’t load in your own samples. This massively reduces the creative potential of the app as a genuine music making application more than anything else, not least because all the sounds are still copyrighted by Gorillaz making release of any tunes you create all but impossible. Still it’s excellent fun and really easy to use. 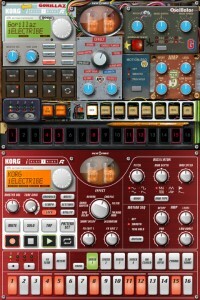 Standing head and shoulders above all the other DAWs I have used on the iPad (among them Music Studio, Beatmaker and Garageband) is Electrify. It shares a similar interface style with the excellent TouchOSC, which I use as a controller for Logic, and most importantly allows you to import your own samples. 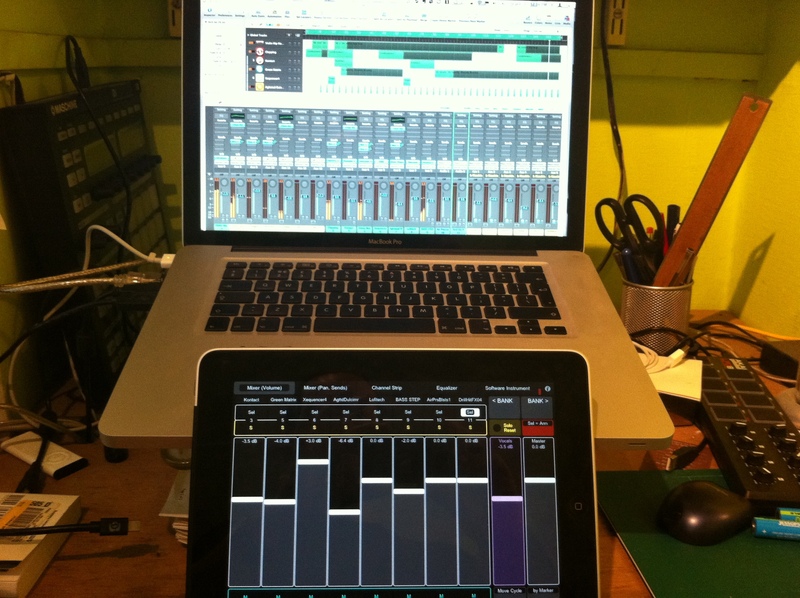 Initially confusing, it’s a bit like an iPad version of one of those square Ableton controllers. But once you’ve played with it for a bit, it’s astonishingly easy, while the 8 x 8 main matrix allows you to develop interesting pattern sets using a variety of instruments and sounds. Using it as a drum machine is simplicity itself, but it really comes into its own when you move beyond the use of simple drum samples and start using a greater variety of samples, and this is where the ability to use your own samples comes into its own. I’ve only been playing with it for a couple of days, but here are two tunes I’ve banged out already.